Aerogel is a synthetic porous ultralicht material derived frae a gel, in which the liquid component o the gel haes been replaced wi a gas. The result is a solit wi extremely law density an law thermal conductivity. ↑ "Definitions of terms relating to the structure and processing of sols, gels, networks, and inorganic-organic hybrid materials (IUPAC Recommendations 2007)". Pure and Applied Chemistry. 79 (10): 1801–1829. 2007. doi:10.1351/goldbook.A00173. 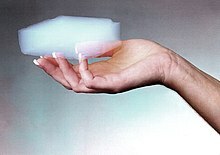 ↑ "Guinness Records Names JPL's Aerogel World's Lightest Solid". NASA. Jet Propulsion Laboratory. 7 May 2002. Archived frae the oreeginal on 25 May 2009. Retrieved 2009-05-25. This page wis last eeditit on 4 September 2015, at 15:33.